I learnt to make Hainanese Pork Chop from my father-in-law. My family love a delicious pork chop which is tender on the inside and crusty outside. This traditional Hainanese pork chop is coated with cream cracker crumbs. Then it is deep fried. I learn this from my late father-in-law who was a talented cook. He could cook a ten-course meal for one hundred guests at a wedding banquet by himself. I was newly married, too young then to want to learn cooking from him. Now I am trying to remember what he taught me and compile his recipes into a book for our younger generations. 1. Tenderise pork chop with back of cleaver or tenderiser. 2. Marinate the pork chops for at least an hour. 3. 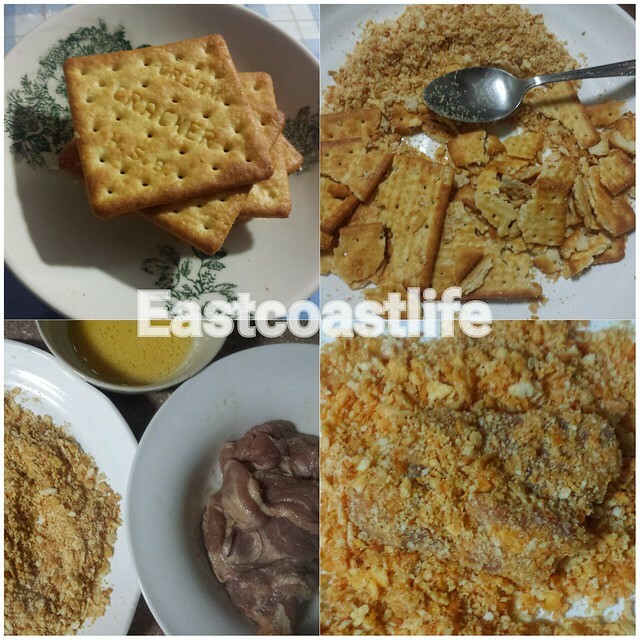 Put cream cracker crumbs on a shallow plate and coat marinated pork chop with egg followed by cracker crumbs. 4. Heat enough oil in the wok to deep fry pork chops. 5. Deep fry the coated pork chops until golden brown. Remove them and place on an oil blotter. 6. 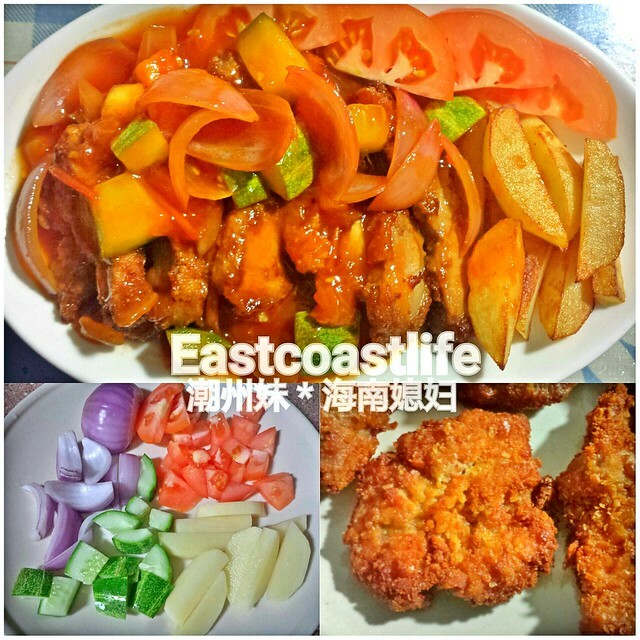 Slice fried pork chops and serve with steamed white rice or cook a sweet and sour sauce to pour over it. Heat wok and add oil. Fry the sliced onion until it is fragrant and turns transparent. Add flour and stir fry for a minute. Add the sauce seasoning, tomato and green peas. Lower the heat and simmer the sauce until thicken. I also added cubed cucumber and tomatoes into the sauce besides the onion,. For my son, I would add fries as a meal by itself.